Jidi Majia is an indigenous poet of the Nuosu (Yi) people of mountainous southwestern China. His work expresses the mythic world and cultural tradition of the Nuosu, while being deeply concerned with the urgent problems of global strife. Born in 1961 in Sichuan, Jidi Majia has published over twenty books of poetry in several languages, and been awarded his countries most important literary prizes. He is president of the China Minority Writers Association and director of the Qinghai Lake Poetry Festival. I, Snow Leopard is both a lyric and an elegy. It is easy to imagine its lines being loudly hailed in whatever country the poem finds itself in. Its publication comes at a time when people everywhere have begun to wonder what a voice like this, suppressed for centuries, wishes to say now, in this moment when the Snow Leopard’s human brothers and sisters find themselves side by side with him. Imperiled. 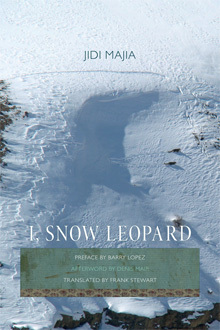 "Speaking in the voice of the endangered Snow Leopard, poet Jidi Majia conjures a mysterious, magnificent creature with a message about the consequences of unchecked violence toward animals—and equally about the violence that threatens the heart of the human species. He evokes a dramatic presence of Snow Leopard—the smoke-gray fur chased with a pattern of dark rosettes “spun from limitless space”; the long, heavy tail serving as balance pole as it bounds across a cliff face; the pale green stare—an animal possessing both metaphorical weight and biological authority."